You may not know this but the posture you have when you setup to hit a golf ball has a big affect on how you will swing the golf club and the potential distance you can hit the golf ball. You see, the posture you have at setup largely determines how you shift your weight as you swing the golf club and whether or not you can make a big, full turn in your backswing. Also, the posture you setup with will have a big affect on your balance as you’re swinging, and with how much power you can swing down into the golf ball. Creating a good setup posture position is very easy to do. But sadly a lot of amateur golfers either a) don’t place enough importance on it, or b) they think their posture is already good enough. This means that many amateur golfers have very bad setup posture positions, which creates a lot of bad golf shots. But as I have already said, having a good posture position is very easy. So here’s a simple 6 step process to help you get into a good setup posture position. 4th. Bend forward slightly while making sure that your spine remains straight. Having the golf club on your spine will help you to feel this. When you do this it’s important that you feel as though your backside is moving back like you are going to sit on a chair. Doing this creates a balanced posture position. Also, it’s important that your weight is positioned on the balls of your feet, not on the heels or the toes. So that’s how to achieve a good posture position that will help you to hit longer, more accurate and powerful golf shots. But if you really want to do that you should do that posture exercise at least 20 times a day for a minimum of 30 days straight. This will help to make that posture position a habit so that when you play golf you just setup automatically with good posture. 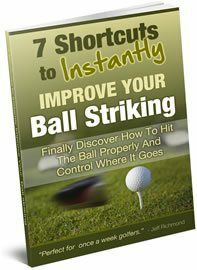 If you do that you’ll find yourself hitting much better golf shots, more often. 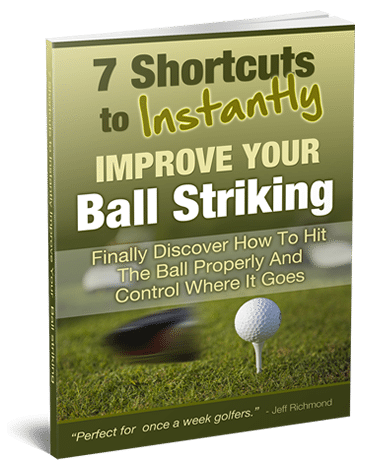 You’ll be amazed at your new found ball striking. So start right now by doing your first 20 and then keep doing them every day for at least 30 days.